Veteran Joe Troupe had a gift for woodwork and motivation. Joseph Randall Troupe, better known as Joe, was a veteran, a skilled carpenter and a powerful motivator. Troupe died Friday after battling lymphoma. He was 67. Troupe's wife, Mary Troupe, is the executive director of the Mississippi Coalition for Citizens with Disabilities. She credits him with helping her live a normal life in spite of being wheelchair bound. Joe Troupe was born in Columbus, Miss., in 1942. His family later moved to West Point, and Troupe graduated from West Point High School. After graduation, he joined the Army and served as a Morse code operator in Okinawa, Japan, before returning to serve with the Army National Guard. He pursued his love of Morse code back home, as well, joining the Jackson Amateur Radio Club. Troupe retired from the Army in 1992 and switched gears to pursue another great passion: woodworking. He formed a company, J.R. Troupe Construction, and did custom cabinetry and woodwork for private builders. "One of his pride and joys was having the wife in a new home come in with a picture from Southern Living and say, 'I want this mantle,'" Mary Troupe said today. "He'd build it, and they'd say, 'I didn't know it was going to be just like it!'" Mary Troupe met Joe at a trying time. In 1972, after returning from rehabilitation after an injury that left her unable to walk, Mary was in the process of divorcing her then-husband. Her divorce attorney's secretary, one of Mary's friends, was dating Joe at the time. "That was when a lot of peopleand of course some still don'tdidn't think that people with disabilities can have a life," Mary said. "He never ever thought that. He was right there with me." When Mary got her first set of hand controls for her car, she thought she would never master the apparatus and drive again. Joe drove the two of them to the reservoir and told her: "Slide over. You're fixing to drive." He was right: Mary learned to drive again. Joe retired from his construction company in January 2009 and was diagnosed with lymphoma in February. Mary praises the Veterans Administration for taking excellent care of her husband. Troupe is survived by his wife, their three children and six grandchildren. A memorial service will be held this afternoon at 2 p.m. at the Mississippi Agriculture Museum Chapel on Lakeland Drive. 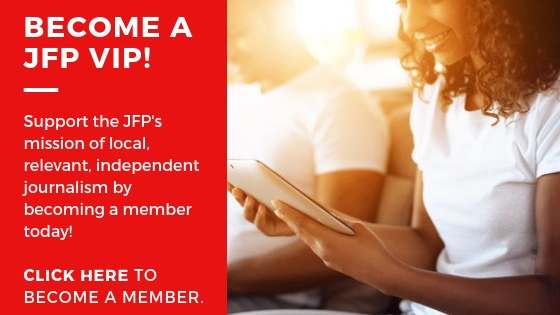 Do you know a Jacksonian or Mississippian who should be the JFP Person of the Day? Briefly tell us his or her story, sending it to [e-mail missing]. Please include contact information and a picture, if possible. ON THE ISSUES: Special Needs: Left Behind?